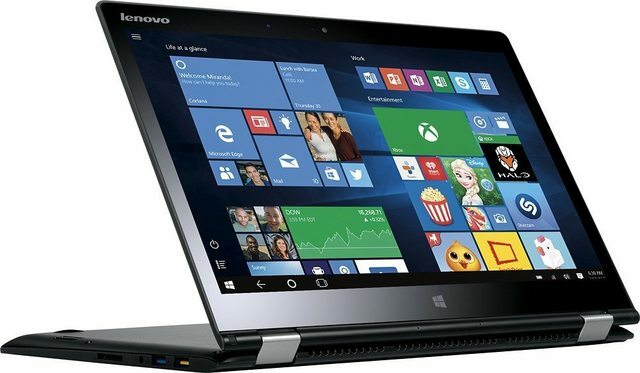 The Yoga 3 (80JH0025US model) is a newly introduced variant of the successful 2-in-1 notebook solution from Lenovo. Although not as refined as its older brother, the Yoga 3 Pro, this laptop will surely impress through hardware specifications, quality materials and general ease of use. First thing we notice about the Yoga 3 is the fact that it’s not a traditional laptop, but a 2-in-1 convertible, which means you can use it in many different configurations depending on your needs: either as a laptop, as a tent, stand or as a tablet by fully rotating the screen outwards toward the back casing thanks to its 360 degree rotating hinges. Completing this ergonomic design is a bright IPS, Full HD touchscreen display which is responsive enough to rival established tablets. Also, to add some extra functionality to its device, Lenovo provides something called “Yoga Harmony”, which changes settings based on the configuration you’re using to make the transition easier and more efficient. Hardware wise, the Yoga 3 is impressive should prove itself as a useful assistant and travel companion. It’s not the lightest notebook, but considering that for a price just under $800 you also get tablet functionality, I’d say the 3.5 pounds it weighs are a pretty good compromise. The 4-Cell battery will last up to 7 and half hours, while also smart charging your other mobile devices through the Sleep-and-Charge USB3.0 port. It comes equipped with a dual core, 5th generation Intel i5-5200U processor, 8 gigabytes of soldered system memory (basically meaning it’s not user replaceable) and a 256 gigabyte solid state drive. All of a sudden, the Yoga 3 80JH0025US seems like a very good deal. It’s a hardware package that you’d normally get in a classic notebook for about the same money (without the benefit of having a 2-in-1, extended battery life and improved portability) or in a more expensive ultrabook. This configuration will allow the notebook to run smoothly and feel very snappy, even when heavily multitasking. Other noteworthy features include a 802.11ac dual band wireless card and a standard notebook backlit keyboard, very useful for working late in the night without necessarily keeping the lights on. As a conclusion, the Lenovo is a good deal considering the price. It’s portable enough to carry around without feeling overburdened, functionality is great considering the multitude of ways it can be used as and will hold a charge for a good part of the day. With the added benefit of having good tech specs all around, this versatile notebook is a great option for most users who want more than just a classic notebook computer.